Stylish and elegant, the silver background on this martini lounge plaque make it perfect for a main floor bar, lounge or den. The martini is one of the drinks that every bartender should be able to create, so be sure to brush up on the recipe. 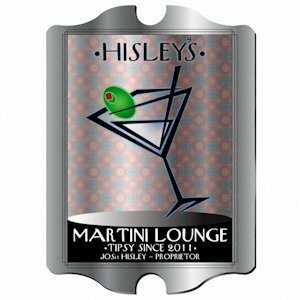 Perhaps this lounge sign will jog your memory with a contemporary image of the martini. Personalize it for a one-of-a-kind gift.